This was a very exciting occasion which marked Pegasus’s 21st birthday and one of the greatest of all choral works. The first work ever given by Pegasus was the Vespers, and they were delighted to have the opportunity to present this great piece again in their 21st anniversary year. They were accompanied by an orchestra of strings, cornets, trombones and organ with a magnificent theorbo taking centre stage with the double bass. 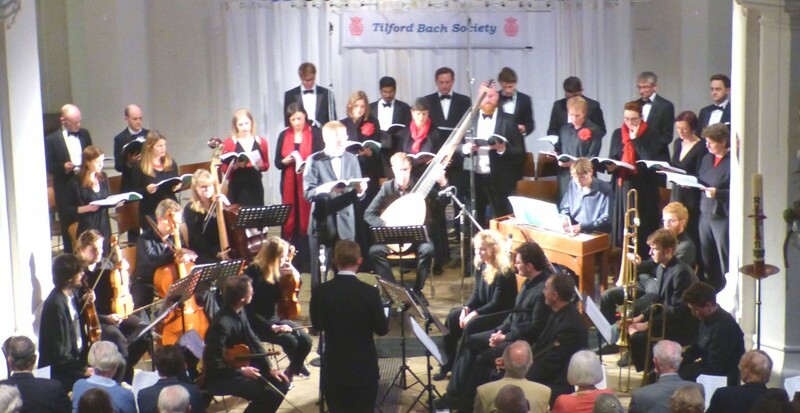 The leader was Adrian Butterfield, music director of the Tilford Bach Society and the conductor Mattew Altham, director of the Pegasus Choir. Monteverdi’s Vespers is a majestic work containing settings of psalms contrasted with other passages of scripture and hymns, concluding with a setting of the Magnificat; and the music contrasts full, exciting sounds with lighter, dance-like movements for single voices either as solos or in small combinations. All the soloist came from the choir itself: in fact, over half the singers took a soloist role. Pegasus are fortunate indeed to be able to call upon so many members to take on solos. There were many, many moments of pure delight – too many to be mentioned here– but the entry of the brass instruments at the beginning of the Laudate Pueri was particularly dramatic, as was the largely instrumental Sonata, with soloists singing Sancta Maria. So, indeed, were the echo effects such as those in the Audi Cœlum where the echo picks up the last syllables of the Latin words of each verse to make a new word as a response to or a commentary on it. In verse 3 of the Magnificat two of the cornett players put down their instruments and took up recorders to accompany “for he hath regarded the lowliness of his handmaiden”. There were also notable occasions where a soloist was accompanied by the Gregorian plainchant setting of the same words (a device later used by Bach in his setting of the Magnificat and elsewhere). All in all it was an evening to treasure.